Public-interest lawyer Bryan Stevenson delivered the remarks below at TED2016, following a talk by architect Michael Murphy (TED Talk: Architecture that’s built to heal), who is designing The Memorial to Peace and Justice. The memorial is scheduled to open in spring 2018. Today in America we are not free. We are burdened by a history of racial inequality and injustice. It compromises us; it constrains us. We live with the legacy of slavery, and that legacy has created a shadow that undermines so many of our best efforts to get to something that looks like justice. The great evil of American slavery was not involuntary servitude and forced labor. To me, the great evil of slavery was the narrative of racial difference, the ideology of white supremacy that we created to make ourselves feel comfortable with enslaving people who are black. We’ve never addressed that legacy. To me, the great evil of slavery was the narrative of racial difference, the ideology of white supremacy that we created to make ourselves feel comfortable with enslaving people who are black. We’ve never addressed that legacy. In the 13th amendment, we have language that prohibits involuntary servitude and forced labor. But we never talked about the narrative of racial differences, and as a result, I don’t believe that slavery ended in 1865. Instead, it turned into decades of terrorism and violence and lynching that terrorized people of color. Thousands of people were pulled into courthouse squares in America, brutalized and sometimes even burned alive. 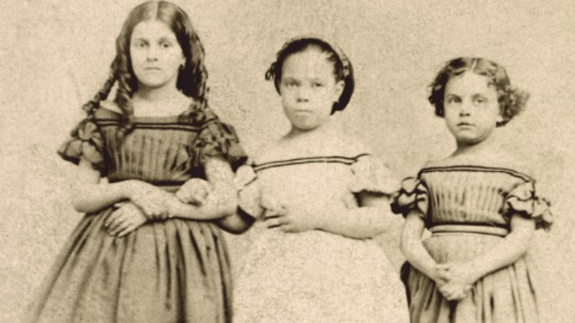 Before the Civil War, the 3 children pictured here were sold as slaves in the United States. 1863 albumen print, carte-de-visite: ‘Rebecca, Augusta and Rosa. Slave Children from New Orleans’. Image courtesy of George Eastman Museum. The demographic geography of this nation was shaped by terrorism. The black people who moved to Cleveland and Chicago and Detroit and Los Angeles and Oakland and New York and Boston didn’t go to those communities as immigrants looking for new economic opportunities. They went to those communities as exiles and refugees from terrorism in the American South, and they are burdened by that history. Even during the Civil Rights era, we never confronted all the pain and anguish that was created by decades of segregation. During that time, we said to black people, “You’re not good enough to vote because you’re black”; we said to black kids, “You can’t go to school with other kids because you’re black.” I started my education at a colored school. My parents were humiliated every day of their lives when they saw those signs that said “white” and “colored.” They weren’t directions; they were assaults. We haven’t addressed this. We try to press on instead, but now there’s a presumption of dangerousness and guilt that follows black and brown people in this country. It’s why kids are being killed on the streets by police officers. If we create spaces where we resurrect the truth, we can get to something that feels more like freedom. I tell you this because our history has scarred us, it has bruised us, and it has injured us, but when we tell the truth about our history, we can change things. 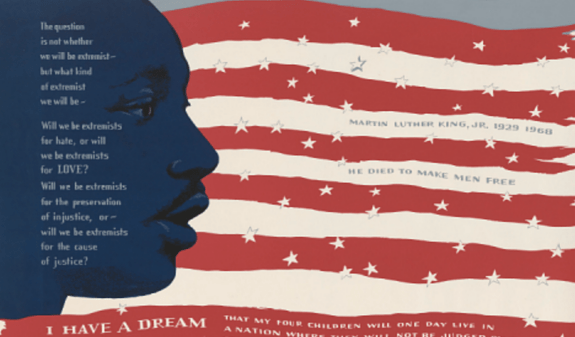 If we create spaces where we resurrect the truth, we can change the iconography of the American landscape; we can get to something that feels more like freedom; and we can achieve something that looks more like justice. We can shift this narrative that has burdened us and resurrect the hope that animates many of us. That’s why I’m excited about projects like The Memorial to Peace and Justice, a memorial to victims of lynching in Montgomery, Alabama. It’s a place that will tell a hard story but a necessary one. You can’t go to South Africa without seeing these incredibly difficult but important monuments and memorials to apartheid; you can’t go to Rwanda without being reminded of the genocide; you cannot go 100 meters in Berlin, Germany, without seeing a marker or a stone that’s been placed at the home of a Jewish family abducted during the Holocaust. The Germans want people to go to Auschwitz and reflect soberly on the history of the Holocaust. We do the opposite in this country, and I think this kind of space will invite us to look at this truth. And when we do, we will find ourselves — maybe for the first time — freer, more just, more motivated and more liberated from our history. Bryan Stevenson is the founder and Executive Director of the Equal Justice Initiative in Montgomery, Alabama. Under his leadership, EJI has won major legal challenges eliminating excessive and unfair sentencing, exonerating innocent death row prisoners, confronting abuse of the incarcerated and the mentally ill and aiding children prosecuted as adults. Stevenson has successfully argued several cases in the United States Supreme Court and won an historic ruling that mandatory life-without-parole sentences for all children 17 or younger are unconstitutional; he and his staff have won reversals, relief or release for over 115 wrongly condemned prisoners on death row. He is also a Professor of Law at the New York University School of Law.